Posh full-back Tobi Adebayo-Rowling (right) is back in the squad for the trip to Burton. 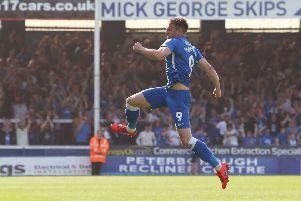 Peterborough United’s defensive injury problems have eased ahead of Saturday’s (August 22) League One match at Burton Albion. On-loan central defender Alex Davey and teenage right-back Tobi Adebayo-Rowling have both been passed fit. Davey limped out of Tuesday’s (August 18) home defeat at the hands of Sheffield United with a tight hamstring, a match Adebayo-Rowling missed vecause of a groin injury. Ntlhe was also substituted against The Blades because of a toe injury, but X-rays have shown there is no break. He will be monitored closely for the next 36 hours, but Posh may try and sign a left-back on loan before the weekend. Midfielder Harry Beautyman is also available for the first time this season after recovering from a thigh injury, but right-back Michael Smith remains a doubt because of a back problem. Striker Souleymane Coulibaly is expected to start for Posh at Burton after his goal-scoring substitute appearance on Tuesday. Joe Gormley is the man expected to make way. Posh manager Dave Robertson is anticipating a tough match against a team who have taken life in League One in their stride since their promotion as League Two champions last season. Burton have won two and lost one of their three matches so far. Robertson is however expecting a positive response from his players to their own modest start to the campaign. Robertson said: “Burton are well-organised, they are well-structured and employ good patterns of play. They have two good wingers and the front four are all a threat. “But as always we will have to focus on how we play. We have the potential to be exciting, entertaining and dangerous ourselves and I am confident we will cause them problems. “I know Sheffield United are a very big club by League One standards, but I was still very disappointed to lose to them. The stats didn’t make bad reading from our point of view, but the key moments in the game went Sheffield’s way. “We outshot them 22-20 which was pleasing and one thing we will never do is go down without a fight. The players had a right go and I will always take that from them, but we lost the game and now I expect a positive reaction, not just at Burton, but in the next few matches. “We will have played seven games by the end of August so we will have to utilise the squad to keep our energy levels high. I’ve already seen some League One games this season when players have looked leggy so it’s good for us that Tobi, Alex and Harry are all available at Burton and that there is still a chance we will have Kgosi and Michael Smith as well. “I might even enter the loan market for a left-back so all options are open to me. “Soulemayne Coulibaly has every chance of playing at Burton. He didn’t just knock on my door with his performance against Sheffield, he kicked it down and screamed at me to pick him. Burton are managed by former Chelsea and Leeds United striker Jimmy Floyd Hasselbaink. He’s assisted by former Posh player and youth team manager David Oldfield.